Do you ever wonder what to make with a whole bunch of super ripe avocados? I mean the obvious answer is guacamole, but did you know that you can create something super simple, refreshing, creamy and delicious using just avocados and pantry staples?! This recipe is sponsored by California Avocados. If you have a food processor, an immersion blender or a regular blender you can make this creamy dessert and feel good about it. I’ve lived in California now for 13 years. 13 years! I can hardly believe it! When I moved here from the east coast I quickly realized how lucky I was to have immediate access to premium California Avocados. As an iconic California staple, I love coming up with different ways to use them all year long. 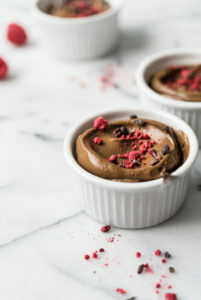 If you’ve never made chocolate avocado mousse before, I think you’re gonna love it. It’s perfect for the approaching warm weather, it can be made ahead and chilled in the fridge, AND the crunchy toppings make it fun and give it great texture. Keep it simple yet creative and have fun with this recipe! Super simple, refreshing, creamy and delicious mousse using just fresh California avocados and pantry staples. Place all the ingredients in the bowl of a food processor. (You can also use an immersion blender, or regular blender). Blend until mixture is smooth and creamy. Store in the fridge until ready to serve.